Bee Movie Game may be based on a hit animated film, but the game has surprisingly little buzz behind it. Get it? Buzz? Never mind. Barry B. Benson is bored. Yes, we get it already. He's been working in a hive all his life and he yearns for something more. So this busy little bee makes his way outside and...moves into a lifestyle with Elaine, George and Kramer. OK, so I'm confusing the Seinfeld mantra with the plotline for Bee Movie Game, but only because Jerry Seinfeld himself has such a big part in the movie. The DS game based on it has some good ideas in its busy-bee little head, giving you the power of free flight and letting you collect pollen like it's going out of style. Unfortunately, it has little else going for it, killing off any buzz it generated in the first place as a result. In the game, you control Barry as he flies through 3-D areas, collecting pollen and completing fetch quests for other characters too lazy to get anything done by themselves. The game mostly consists of these "fetch quests", forcing you to go back, get something, return it and then get assigned a new item to pick up. Sound like fun? You get to dodge enemies as well, although their animation is so shoddy that you can't even tell they've attacked until Barry jumps back after taking damage. Who knew that a schnauser could move so quickly? 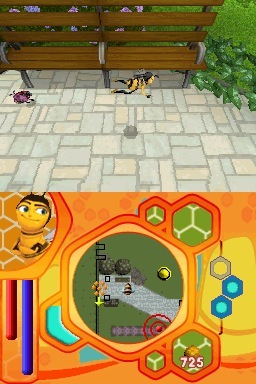 Visually, Bee Movie Game does have its moments -- but they're fleeting. 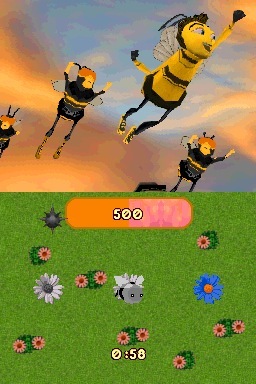 The game is mostly done in 3-D, with Barry able to fly around in a freestyle manner. The game has a terrific flight system, letting him ascend and descend with ease and dash through the place in case he's in a big hurry. Unfortunately, he really doesn't do much else. He can't go and pop someone in the neck if he's having a bad day or anything like that. He can hide, fly, dash and grab items and...that's it. Oh, the sordid life of a bee is so short as it is, and his abilities are limited as well. Poor Barry. With sound, you have chirpy little sound effects, no music score and very minor sound bites. You can't even tell if Seinfeld himself voiced the main character here or not. Bee Movie Game, sadly, is just another example of a wasted license. What could've been a really cool, innovative 3-D adventure from Vicarious Visions ends up instead being another routine bag of "fetch quests" -- easily completed in three or so hours, no less. Do yourself a favor and let it buzz on by. If you still feel like you need your Seinfeld fix, hey, go see the movie. It's probably bound to be more fun than this. What's Hot: An interesting flight system is employed here; some parts of the 3D graphics aren't bad; a couple of fun mini-games. What's Not: Enemies appear unfinished; the mission structure is mostly made up of "fetch" quests; it's all over in a matter of hours.